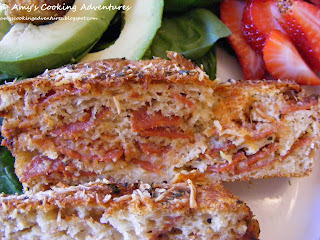 Pepperoni Pizza Quick Bread = all the goodness of pizza without the hassle of making a yeast crust. Let me tell you, this bread is pretty fantastic. It is very simple process with super scrumptious results. Basically, you just toss everything into your electric mixer, toss it into a bread pan (layered with a little pizza sauce), bake, and you’re done! Do note that this is rather difficult to cut when warm, while you can eat it shortly after it is done baking (I did), I recommend planning ahead and letting it cool completely before cutting, and then warming it for 30 seconds in the microwave. Serve with a nice salad and some fresh fruit and you have yourself a meal. And I have to say, it also makes a great midnight snack! 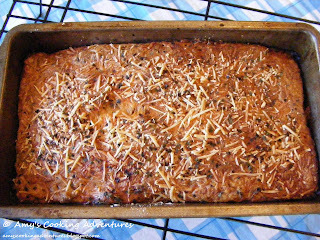 Preheat oven to 350 degrees F. Spray a small (9x5 in) loaf pan with cooking spray. In the bowl of an electric mixer, combine flours, flax, baking powder, baking soda, salt and pepper. Slowly add in the eggs, oil, buttermilk, ¼ cup parmesan, mozzarella, and pepperoni until just combined. Pour half the batter into the prepared loaf pan. Top evenly with the pizza sauce. Carefully pour the remaining batter over the sauce. Sprinkle with the remaining ¼ cup parmesan cheese, pizza seasoning, and garlic powder. Bake for 45-60 minutes or until a toothpick inserted into the center of the bread comes out clean. Let cool for at least 30 minutes before removing from pan. Slice and serve warm or at room temperature. This looks so tasty! It's always great to have a recipe like this that is quick and easy to whip up. This looks soooo good. I have to make this! Like this a lot. Can't wait to try it out for my family. Mmmmm, craving a late evening snack now. :) Looks delicious! 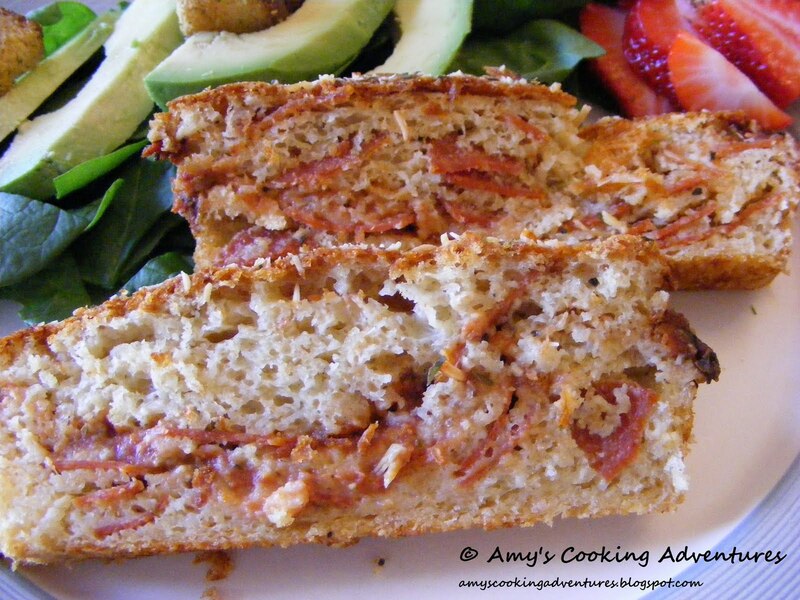 This is a great idea for a quick bread and it looks like it it ever so tasty. That looks really really yummy! I feel like this would be a great thing to have at like a dinner party if you cut it up into little bite size pieces. Would be a crowd pleaser I think! What a great recipe. I'm such a pizza junkie, but I've never seen a quick bread style before. Nummy. This looks so good...going to the printer right now to print it out. Thank you for sharing it!